Human and animal hairs have been used in forensic investigations for over a century. Hair is stable under adverse natural conditions; hence, it is often recovered at the crime scene, and it is necessary to determine whether the hair is of human or animal origin. Morphological and genetic characteristics are useful to differentiate human hair from animal hair. In the present study, we analyzed the distinguishing characteristics of hair of various species. In addition, we explore species identification by cytochrome c oxidase I mitochondrial gene analysis. We confirm that both the microscopic and molecular analyses of hairs are useful in forensic investigations. During the course of a criminal investigation, many types of physical evidences are encountered. One of the most common is hair evidence. A hair can be defined as a slender, thread-like protein outgrowth from a follicle in the skin of mammals. Hair grows from the papilla, which is a metabolically active structure. The shaft of hairs is made up of dead, cornified cells that project outward from the skin and a root that is imbedded in the skin. Composed mainly of keratin, it has three morphological regions: the cuticle, the medulla, and the cortex. The cuticle is a translucent outer layer of the hair shaft consisting of scales covering the shaft. The medulla is a central core of cells that may be present in the hair. If it is filled with air, it appears as a black or opaque structure under transmitted light or as a white structure under reflected light. The cortex is the main body of the hair composed of elongated and fusiform cells. It may contain cortical fusi, pigment granules, and/or large oval-to-round-shaped structures called ovoid bodies. The identification and comparison of human and animal fur can provide investigators with valuable information for potential leads. Microscopic comparison is considered a reliable tool for the evaluation and specific identification of the characteristics found in hair. Mitochondrial DNA (mtDNA) testing can also provide additional information. The combination of these technologies profoundly affects the way forensic scientists, investigators, and prosecutors view hair evidence. Because DNA technologies are time- and cost-consuming, the first step in the analytical process is the microscopic examination, and determination whether the hair is of human or animal origin. Microscopy permits a large number of questioned hairs collected from evidence to be examined quickly, thus minimizing the time and cost of the mtDNA analyses. The microscopic comparison of morphological characteristics of hair has been accepted both scientifically and legally for decades. There are many differences in human and animal hairs such as color, tip, root, cuticle, scale, medulla, cortex, and other special characteristics. In the present study, we analyzed distinguishing characteristics that can be used to differentiate human hair from animal hair and to discern between animal species. Sequence analysis of mtDNA was also performed for genetic species identification. The identification of animal biological diversity was proposed on a large scale through the use of one-short, conserved mtDNA region cytochrome c oxidase I (COI) mitochondrial gene, the “DNA barcode.” This DNA barcoding has become a method for species identification across a broad range of eukaryotic taxa by sequencing the standardized short mtDNA fragment. 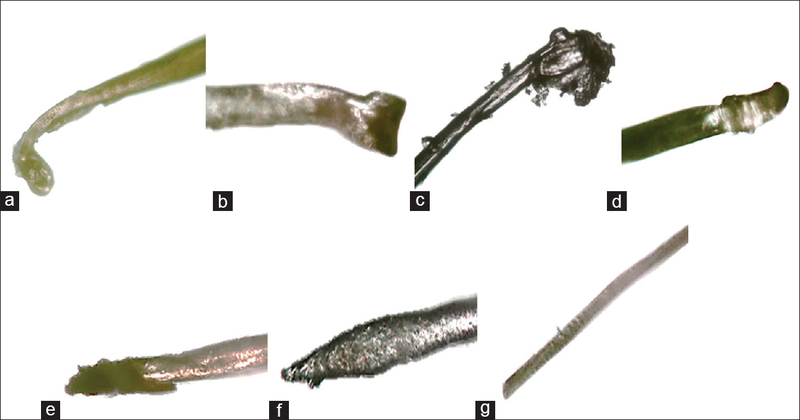 In this study, we also applied this current method for species identification from hair employed for microscopic examinations, to confirm the preliminary taxonomic distinction obtained by microscopic characterization. The study was conducted on the following seven different species from Northern Italy: Homo sapiens (human), Bos taurus (cow), Canis lupus familiaris (dog), Capra hircus (goat), Equus ferus caballus (horse), Felis catus (cat), and Oryctolagus cuniculus (rabbit). We plucked a tuft of hair from the scalp of ten representative individuals of each species studied. The animal hairs discussed are limited to those animals most likely to be examined in our laboratory in forensic casework. All the samples were put in serially marked paper envelopes immediately after they were collected and then stored at room temperature. The same day, each hair sample was cleaned with distilled water to remove dust and debris, if any, and left to dry until the next day. One strand of hair with root from each individual was placed on a microscope slide and cover slipped, for a total of seventy samples. 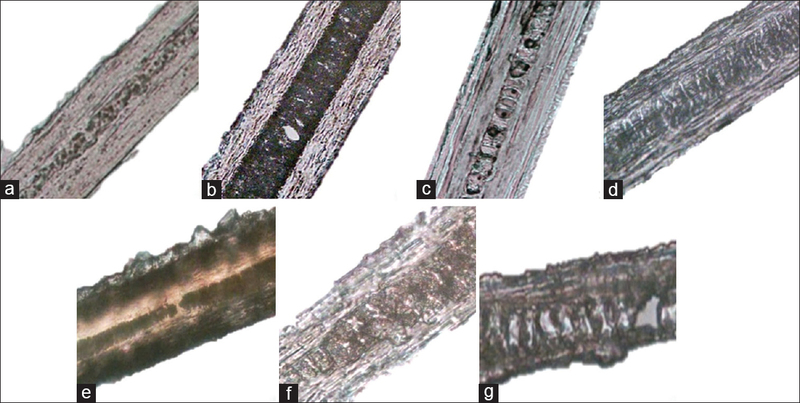 The hair was scanned along the length at 10X, 25X, and 40X under an optical microscope to observe the morphological characteristic of the tip and root. It is very difficult to directly observe scale pattern from hair strand on a slide. Hence, a cast was made using nail polish to obtain the impression of the scales. A thin layer of nail polish was spread on a microscope slide, and a hair was placed in the middle of the slide. The polish was allowed to harden, and the hair was gently removed. Then, the scale pattern was observed under an optical microscope at 10X, 25X, and 40X. To characterize the medulla and the cortex, one single hair of all different species was formalin fixed and paraffin embedded. After fixation, the samples were cut in 4-μm-thick sections on a microtome with a disposable blade. The longitudinal and transverse sections were observed under an optical microscope at 10X, 25X, and 40X. 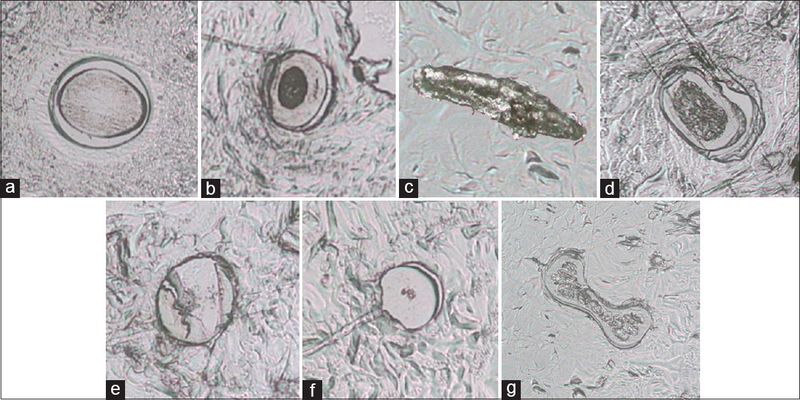 The purpose of this study was to catalog the distinguishing characteristics of different species by optical microscope to differentiate human hairs from animal hairs and to discern between animal species. Many differences in human and animal hairs were found. The results of the microscopic examination of the hair samples are shown in [Table 1]. We were able to speciate all hair samples by microscopic features alone. We have assembled a photomicrograph collection that can be used to differentiate human hair from animal hair and to discern between animal species using the roots [Figure 1], cuticles [Figure 2], and medulla and cortex [Figure 3] and [Figure 4] for all the species analyzed. To confirm the preliminary taxonomic distinction obtained by microscopic characterization, the COI mtDNA regions were successfully amplified. The sequences obtained from each hair were then aligned in the BOLD database; the results reported confirmed the proper speciation as we had determined (data not shown). All of the morphologic characteristics observed for the individuals of the same species were identical, except color. Due to the limited number of individuals studied, the observed morphologic results may not be generalized. Both the microscopic and molecular analyses of hairs are useful in forensic investigations. Microscopic analysis of hairs demonstrates morphological differences that enable discrimination between human hair and animal hair and among animal species. Genetic analysis confirmed the diagnosis of species prior to the microscopic analysis. Furthermore, we demonstrated that treatment carried out for microscopic observation, formalin fixed and paraffin embedded and deparaffinized in xylene, does not compromise the subsequent genetic investigation. The use of optical microscope to observe hair from humans and other species, therefore, allows a first screening for the hair selection to be submitted to DNA analysis, allowing a saving of time and costs, thus avoiding the genetic molecular analysis of nonhuman hair. We can also confirm the ability to speciate hairs by microscopy alone, when the genetic profile is incomplete or inconclusive. However, we suggest both techniques must be used to confirm the species of the sample. The authors thank Dr. Heitor Correa for his help in English revision. Houck MM, Budowle B. Correlation of microscopic and mitochondrial DNA hair comparisons. J Forensic Sci 2002;47:964-7. Bisbing RE. The forensic identification and association of human hair. In: Saferstein R, editor. Forensic Science Handbook. Vol. I. Englewood Cliffs, NJ: Prentice Hall; 2002. Bisbing RE. Human air in a forensic perspective. In: Proceedings of International Symposium on Forensic Hair Comparisons. Quantico, VA: FBI Academy; 1985. Kshirsagar SV, Singh B, Fulari SP. Comparative study of human and animal hair in relation with diameter and medullary index”. Indian J Forensic Community Med 2009;2:105-8. Deedrick DW, Koch SL. Microscopy of Hair Part II: A Practical Guide and Manual for Animal Hairs. Forensic Science Communications. Available from: https://www.fbi.gov/about-us/lab/forensic-science-communications/fsc/july2004/research/2004_03_research02.htm. Wilson-Wilde L, Norman J, Robertson J, Sarre S, Georges A. Current issues in species identification for forensic science and the validity of using the cytochrome oxidase I (COI) gene. Forensic Sci Med Pathol 2010;6:233-41. Robertson J. Forensic and microscopic examination of human hair. In: Forensic Examination of Hair. London: Taylor and Francis; 1999. Ferri G, Alù M, Corradini B, Licata M, Beduschi G. Species identification through DNA “barcodes”. Genet Test Mol Biomarkers 2009;13:421-6. Ratnasingham S, Hebert PD. A DNA-based registry for all animal species: The barcode index number (BIN) system. PLoS One 2013;8:e66213. Ratnasingham S, Hebert PD. Bold: The barcode of life data system (http://www.barcodinglife.org). Mol Ecol Notes 2007;7:355-64. Hebert PD, Cywinska A, Ball SL, deWaard JR. Biological identification through DNA barcodes. Proc R Soc Lond B 2003;270:313-21. Hajibabaei M, Singer GA, Hebert PD, Hickey DA. DNA barcoding: How it complements taxonomy, molecular phylogenetics and population genetics. Trends Genet 2007;23:167-72. Hebert PD, Ratnasingham S, deWaard JR. Barcoding animal life: Cytochrome c oxidase subunit 1 divergences among closely related species. Proc Biol Sci 2003;270 Suppl 1:S96-9.